The new E 400 d replaces the E 350 d and uses a new 3.0-litre straight six turbodiesel engine with an output of 340hp and 700Nm (up from 258hp and 620 Nm), delivering up to 48.7mpg (combined cycle) and emits 154g/km of CO2 (46.3mpg and 161g/km for the Estate). Despite its economy, performance remains rapid with 0-62mph in 4.9 seconds (Estate 5.1 seconds) and an electronically limited top speed of 155mph. The E 53 4Matic+ is equipped with a 3.0-litre biturbo in-line six cylinder petrol engine, with EQ Boost technology that adds 20hp and 250Nm on top of the system output of 435hp and 520Nm torque. Performance for the Coupé is 4.4 seconds 0-62mph (4.5 seconds for the Cabriolet) and economy of 32.5mpg (combined cycle) and 203g/km CO2 (Cabriolet: 32.1 mpg and 200 g/km). Prices for the E 400 d start at £52,685 for the Saloon, and £54,685 for the Estate. 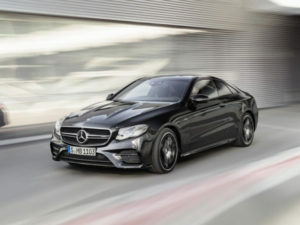 The Mercedes-AMG E 53 4Matic+ Coupé is available to buy from £62,835, while prices for the Cabriolet start at £69,285. Order books are open now with first deliveries arriving in September.